I read interesting informative posts and articles about business, social media, marketing, networking, and the like all the time. I'm a bit of a junkie when it comes to this type of thing. So I thought I would share at least one said post or article every Friday, and maybe send you into your weekend with some food for thought. This week I am sharing three infographics that look at how we use social media, and the impact it has in our daily lives. "Aided by a tech-illiterate manager, a pair of basement-dwelling dweebs makes the most of life in IT at a corporation run by a cloddish new owner." This series is absolutely hilarious! Lots of dry British humour. I particularly like to watch it with my engineer Hubby who for more than 20 years has had to play the IT role, while I am the tech-illiterate one. It is a brilliant show, that pokes fun at so many stereotypes. I rated this series 4.5/5 :-) faces. Content is King (or Queen) - Should be easy now that you know...Right?! You will hear it everywhere, from all the top social media gurus. Content is King, Everyone needs, wants, and must have good, unique, original, top grade, content. I see and read posts about how this "content" will drive more traffic to your blog, and increase readers, and followers. People say write what you know or what you are passionate about, and focus on that. I know lots of things, and I am passionate about many things. I don't want to write about a single area, or topic. Am I doomed to be banished to the island of misfit bloggers? I agree with the "gurus" content is important, and I do not want to read posts that are a rehash of old stuff, or page after page of promotions and sales pitches. I want to read a post that gives me insight, teaches me something, makes me think about a subject in a different way, or think about it at all. I want to read something that makes me laugh, or cry, or surprises me, and ideally calls me to action in some way. I also want that content to look nice with graphics, pictures, font choices, and borders, all without being busy, or distracting. It is a pretty tall order. I am relatively new to blogging with no formal writing experience, or training in social media. I muddle along trying to get Blogger to do what I want it to do with varying degrees of success, depending on the given day. None the less, I want to give my readers all the things I want when reading a post. I want to write posts that make people smile, or think, or respond. Now that I know I need excellent content, and what I like to read, and what I want to write, it should be so easy..... NOT. I know what I like when I see it or read it, but I am not so clear on how to write it. I am passionate about, and know about many things, so I write about them, but that has a tendency to make my blog look busy and unfocused. I simply cannot help it, I am a multifaceted person, with a variety of life experiences. The lighter weight content threatens to bury the more important messages I have to share; but it can't be all work, otherwise Cathy will become a very dull blogger. My eye for design far outweighs my abilities to make that vision materialize on my blog. Then there are the questions that whirl around in my head like a merry-go-round, about citing images, quotes, posts, within posts. Not to mention what seems to be endless and ever changing rules that it not followed threaten my blog's very existence. I constantly worry about pressing publish only to find grammar and spelling mistakes. With all that who has time to write content, far less good content. On that note, without a proper transitioning sentence, I begin the conclusion to this light weight content piece. I always aim for well written posts that make the reader happy they took the minute or two to read it, and hopefully inspire them to read more my other posts. If my content is not "King" it is not for lack of trying. My writing, my blog, and myself are all a work in progress striving to be the very best we can be. I like to think of my blog as heir to the throne. 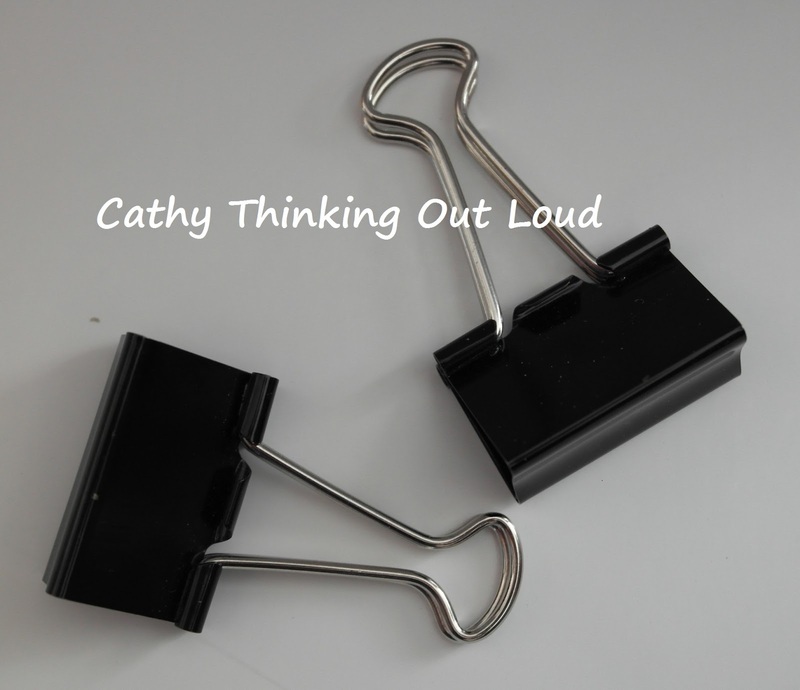 Yep, just me Cathy thinking out loud about content. I read interesting informative posts and articles about business, social media, marketing, networking, and the like all the time. I'm a bit of a junkie when it comes to this type of thing. So I thought I would share at least one said post or article every Friday, and maybe send you into your weekend with some food for thought. This week we look at the often misunderstood Online Community Manager. What exactly is an Online Community Manager, What do they do, and does your business, or brand need one. Maybe it is just me, but I feel like over the last six to eight months the engagement and the tone of many brands on twitter and facebook has shifted to a very formal feel, and the "one on one" engagement I had become accustom to has dried up. Gone are the days of friendly banter and personal engagement. Several of my favourite long time brands seem to rarely respond, joke, or engage any more. I know I am not the only one to have noticed this. It is like some CEO or Marketing Exec has said no more fun, it is not professional. For me this engagement is what makes me love a brand. It gives a brand a personality. I think who ever is in charge there really understands my need to connect with and respect the brands I invest my hard earned dollars in. It makes them approachable, and sets the tone for our relationship. Believe me when I say it is a relationship, I have been dealing with some brands longer than my 21 year marriage, and have invested a small fortune in them. Do we need a relationship counselor? Don't get me wrong I am in no way encouraging unprofessional, or inappropriate twitter exchanges, and I expect excellent quality, customer service, and issue resolution, but when a brand jokes, and engages sharing trivia or pictures, or has a really fun contest, it is the equivalent to someone saying hello and remembering my name at a store. If makes me feel special, and important. It makes me want to come back. It builds loyalty and a rapport ... a relationship. If you have nothing other then promotion, marketing, and sales pitches for me then this is a one way conversation and not a relationship that interests me. Lets save time and leave that for TV or radio advertising, or send it to me in a newsletter. All of these are one way communication tools. If your response is you need to be on social media, then you also need to understand that social media is a two way conversation. I have watched a fun comment by a brand snowball into group participation and a collective "LOL", which my friend is meaningful interaction and engagement. Every person who reads or participated in that exchange will remember it, and for me if I haven't tried that brand there is a good chance I will. It definitely makes me want to share my positive experience with my friends and family, and as many of you know I am very good at sharing. You see they too want to feel special and like they are more than just a sale. Yep, just me Cathy thinking out loud about brands and engagement. Generally speaking, life demands we at least to some extent learn to be social, and appear to enjoy those social experiences. You may know someone like this, or this may be you; the well trained introvert, who appears to be an extrovert, and a social butterfly. It is not always obvious, but if you know them well or look closely you see the cracks, and signs of stress, or fatigue. In general life demands we at least to some extent learn to be social, and appear to enjoy those social experience. In fact the more outgoing and social the better. I spent quite some time trying to find a definition of introvert that wasn't negative, or defined as being wrapped up in oneself, or shy. It is often associated with being nerdy, bookish, quirky or quaint. To me being wrapped up in oneself is narcissistic, and shy is shy. Although many introverts may indeed be shy, that is not what makes one introverted. Interestingly the definitions for extroverts all seem to define it as "friendly" and outgoing, and as a positive trait. There seems to be an assumption if you are chatty, that somehow makes you a nicer person. In my experience nice and not nice comes in all shapes, sizes, and types, and niceness and friendliness is not the exclusive domain of the extrovert. Being introverted doesn't mean you can't be social, and chatty and friendly, and being an extrovert doesn't mean you don't enjoy personal time on your own. What it comes down to is how you feel about varying degrees of social interaction, alone time, and how much of each is right for you. In general I would say that for an extrovert being out with people and interacting with people energizes them. 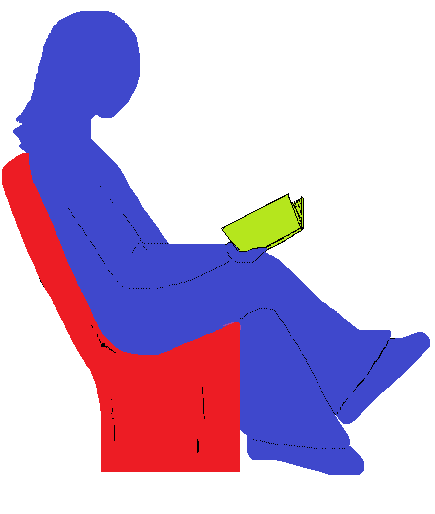 For an introvert this experience drains them of energy, and the alone time allows them to "recharge". It is not about being opinionated, or nice, or smart, or confident, or happy. It is simply how one responds to the social stimuli around them, and how they "charge their batteries" so to speak. Most people including family think I am your basic extrovert, chatty and always cracking a joke. I mean if it walks like a duck, and quacks like a duck, it is probably a duck, right?! The joke part is probably true, but if I can opt out of parties, outings, and crowds, I almost always do. I'm not talking about lunch with a friend. I am talking about events that require extended small talk and interaction with people, or that allow for little or no alone time. The longer I'm out in these types of situations the more I tend to chat, and make jokes. It is a nervous reaction that seldom works in my favour. Ideally I have advance notice to mentally prepare, but often by the end of such events I'm mentally and physically exhausted. Few, except maybe those who know me well will see the signs of strain, unless it's over an extended period. Even then it's easily put it down to being tired, or having a bad day. A perfect example is Christmas visits to see my family. I find them to be very challenging, not because my family isn't lovely, they are, but with the long drive, living out of a suitcase, multiple trips, visits and obligations, all put into a short time frame, it means I'm virtually never alone. I love my family and I am happy to, and want to see them, but I can only do so many hours of 17 people, with no way to politely excuse myself, and even if I could, nowhere to go. I'm trying to balance being a hermit, getting out of my comfort zone by saying yes to a party or event invite I'd normally say not to. It's healthy for me to try new things, get out there and be with people. When I venture out into the social world I try to build in buffers, and limits, if I didn't I would never go out. I try to make sure I attend events in a positive frame of mind with the assumption that I will have fun and it will be successful. Having a plan, and some control over the situation helps to ensure it is. There are limits to the length of time I can stay, so included in my plan are escape routes. I tend to drive my own car to events, or in the case of my first blog conference chose not to share a hotel room. This doesn't always work, since not knowing anyone at a conference, and being in my own room makes it harder to bond with the group, or even know what the group is doing. Often I miss the spontaneous things, like a group getting together for dinner, or a drink. This can make it hard for me to manage or "plan", especially if I do not know the group of people well. I want to be included, but at the same time need my space. It helps if there is someone I can arrange with to let me know if something comes up, or if I can prearrange to meet up with people. Sessions, workshops, or speeches are easy, you have signed up for them, and there is no expectation that you know someone. With purely social events it gets a bit trickier to manage since attending alone is hard, and when I go with someone I worry they'll be upset if I exit stage left after an hour. I'm still working on this, but by controlling some of the things I can, it makes dealing with the ones I can't easier. My goal, which is a work in progress, is to fully participate in life, being true to myself, and making everyday as happy and successful as I can. 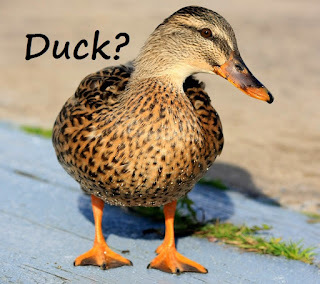 I always try to remember just because it quacks like a duck, doesn't mean it is a duck. 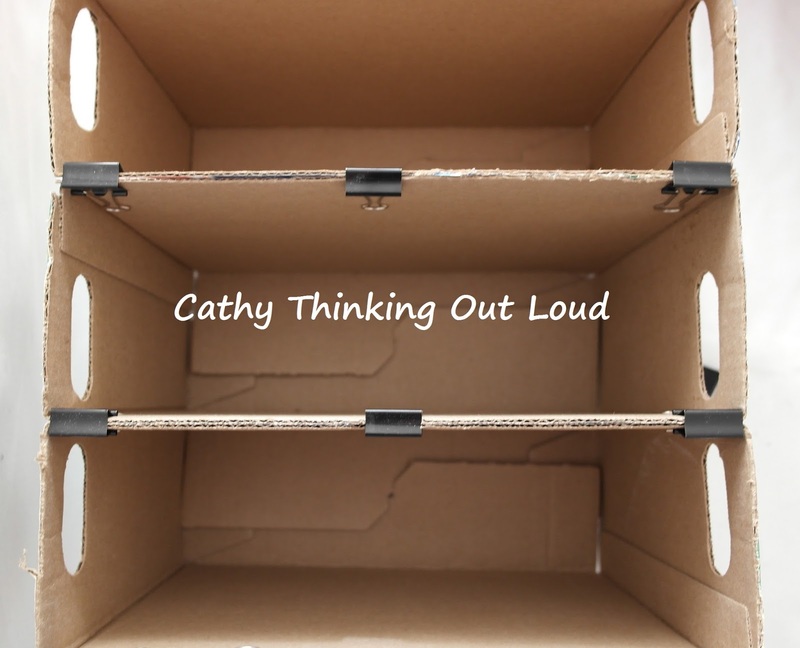 Yep, just me Cathy thinking out loud about myself. "In this procedural crime drama, Dr. Cal Lightman help the police by using his knowledge of human behaviour to determine whether a person is lying. This is an excellent series, that is action packed, and never gets dull. Each episode is different, and leaves you wondering how the truth will come out. I like the fact the Dr. Cal Lightman is not perfect, and his faults make easier to relate to him. I rate this series 4.5/5 :-) faces. I am a very small fish and Tammi My Organized Chaos, Jennifer Mom vs the Boys, Lena Listen to Lena, Kathryn Mommy Kat and Kids, and Stephanie How To Survive Life in the Suburbs are big fish in the world of social media and blogging. I am seriously small - 800 visits on a good month, versus the big 10,000+ visits. I joined twitter in June 2012, and then ventured into the blogging world July 5th, 2013. When I started twitter to say I had no idea what I was doing is a HUGE understatement. These lovely ladies were some of the first to follow me, welcome me, and help me. They were kind and gave me the courage to join in twitter parties, and ultimately the confidence to start a blog of my own. 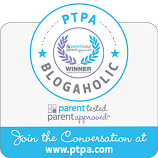 I would be remiss if I did not say a huge thank you to Sandy first as Zwap and then as Canadian Blog House, Monica The Online Mom, and Jean aka Geek Babe The Shopping Queen as well. In December 2012 my twitter account was having issues that even twitter did not understand. Once again they were one of the first to follow my new twitter account. Many of these ladies have also extended their friendship and included me as one of their Facebook friends as well. I am not sure they have any idea how important that was and continues to be to me, but I think it is important to tell them. It has been HUGE! So from the bottom of my heart THANK YOU! Wanda @BookaliciousCA #Bookalicious is indeed "alicious"
Bookalicious: Derived from the word Book and the suffix Alicious. You may not recognize the picture of Wanda, but you are sure to recognize the twitter handle: @BookaliciousCA. She is the author of the Yummy Mummy Club Bookalicious Blog and the host of #Bookalicious Twitter Book Club chats. She is indeed someone delightful and extremely attractive both inside and out. In fact there are many "icious" words that describe both the person, her interviews with authors, and her chats. Wanda's Profile gives you some insight into the person who is seldom in the spotlight. Instead she is usually giving us insights into an author, or a literary work. I have found Wanda to be kind, supportive, insightful, and to have a fantastic sense of humour and adventure. She is a mother, wife, writer, and a champion for many causes and people around her. She encourages us to see topics from different angles, and poses questions that encourage exchanges of thoughts, ideas, and conversation. When Wanda steps out of her comfort zone, she does it with grace, and great success. Capicious: "Changeable" - Wanda can adapt to changing authors, conversations, and book genres. Ficticious: "formed or conceived by the imagination" Many of the books we chat about are Fiction. Ambitious: " Strong desire for success requiring full use of abilities and resources" Wanda brings her "A" game to each interview, and to each chat, making them the success they are. Delicious: "Greatly pleasing or entertaining" Indeed Wanda and the #Bookalicious chats are both pleasing and entertaining. Don't miss the fun, and the opportunity to engage with authors, Wanda and other YMC-BTBC members during #Bookalicious Twitter Book Club chats. For me information follow Wanda on Twitter - @BookaliciousCA and, to read her book reviews, and interviews with authors be sure to check out Yummy Mummy Club - Bookalicious Blog. Yep, just me Cathy thinking out loud about books, Wanda, and Bookalicious. I read interesting informative posts and articles about business, social media, marketing, networking, and the like all the time. I'm a bit of a junkie when it comes to this type of thing. So I thought I would share at least one said post or article every Friday, and maybe send you into your weekend with some food for thought. I found both of these were interesting, thought provoking, worth the read, and maybe worthy of some further conversation. "An abrasive homicide detective moves to the Florida Everglades, but the unusually high murder rate thwarts his plans for relaxing on the golf course." I have seen a few episodes of The Glades and very much enjoyed it, but this recommendation comes from Jazzy6178. I will be taking her recommendation and watching the other 32 or episodes soon. Jazzy rated this series 4/5 :-) faces. Note: I was not compensated for this post in any way. All opinions are my own, and the purpose of this post is merely to share with my readers. To My Auntie Anna: I Love You and I'll Miss You. I started to write this post at the beginning of January. My family lives about a 6 hour drive away, and my Aunt lives another 2 hours from there. This distance and busy schedules make visits few and far between. Although I cherish the visits I do get, it is so easy to say next time, or soon, or I wish I could. These are all true and truly legitimate reasons for not being able to visit. Scheduling a trip requires time we often do not have. Over the Christmas holidays we visit my family and my mother-in-law. Christmas holidays are two weeks long, family time is short, my Hubby only has so much vacation time, and my kids are teens and have homework to do over the holidays. My kids also want to have some of their holidays left to visit friends, and do some of the things they want to do. Between the visits and the two days of driving it is a pretty rushed trip. My parents and mother-in-law only get 1 1/2 days of visit time each on the Christmas visit. My Aunt has been sick for some time. Not a sick she will recover from, but a sick that would see her deteriorate over time. She is a kind, and generous soul, with a great sense of humour, and a twinkle in her eye. Auntie Anna always manages to stay positive, and have a smile for me no matter if she doesn't feel that way on the inside. When I was young she always called us Pumpkin, and had her coat pocket full of change, which we got to reach in, pull out as much as we could and keep it. As an adult we would banter over politics and religion. She knits me colourful dishcloths by the dozen, and shares the beautiful cards she makes. My Aunt is a talented artist, and I cherish the painting of hers I own. Often she would visit my parents over the holidays, or in the summer, and for most of my adult life this is where the kids and I would see her, at my parents while we visited as well. In the past couple years she has been too sick to travel, and my parents would visit her instead, so I seldom got the opportunity to see her. This summer I added an extra day to my visit, packed my parents and my kids into the van and drove to see her. We had a wonderful day, went out for lunch, and my kids took turns with my Dad pushing her wheelchair on a walk through the park. She loves seeing the kids, and the kids love her, it is impossible not too. Flash forward to Christmas time, my Aunt is not doing well and I am afraid I may not get to see her again. So I add a day to our visit and pack up the van with my parents, my kids, my sister, and her daughter, and off the 7 of us go to visit Auntie Anna. My Uncle who lives in the same building gets wind of the visit, and he and his wife join in the visit, and that makes 10. My cousin, whom I have not seen in 20 years since her wedding hears we are visiting and gets her family into the car and drives the 2 hours from the opposite direction to visit, and that makes 14. My poor Aunt, feast or famine, but she seemed delighted, and it was a lovely visit. Another Uncle calls and we debate if he and my Aunt can make it in time to be part of the visit. Yet another cousin I haven't chatted with in at least 10 years calls and we all have a chat with her too. What a day, so worth making the time to visit. A few weeks ago my Mom calls me to tell me my Aunt did not have long now. My parents are in Florida, and I'm an 8 hour drive away. My younger who lives closer decides to drive for a visit and Skype from Auntie Anna place. I knew she was very sick, and in a lot of pain, but she looked so good, and was smiling and waving to me. It was so special to see her. Today my Auntie Anna died. As I prepare for the long drive for her funeral, I wish I had written this post before when she was alive, and I was reflecting on that visit, or even the Skype chat. I wish I had written this when the tears were of laughter at how cute she was showing me her socks matched her nightgown, and wasn't she a fashion plate. Today as I write this it is with tears of sorrow, reflecting on the loss I feel at never again having the opportunity to visit with her. Make time for those visits, hard as it is sometimes to fit them in, it is those memories we will cherish, rather than regret we didn't make time. Sometimes next time, or soon never comes, and it is what we do when our loved ones are living that matters. Sometimes in life Less is More. With Beanitos Bean Chips you get Less AND More. Beanitos Have less fat and sodium, are Gluten Free, Non-GMO, are Low Glycemic, and at the same time provide 6 times more fibre, and protein per serving than many other snack options available. 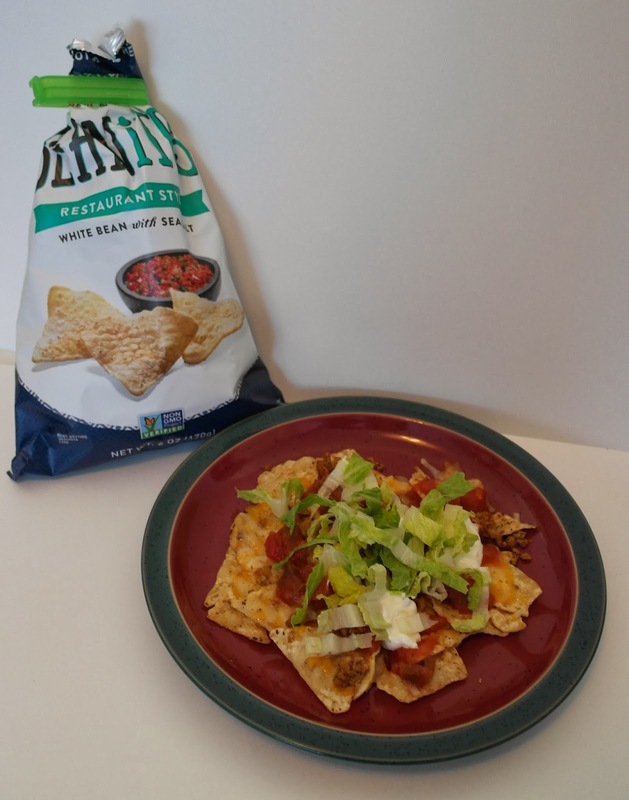 "Minute to Din(ner) It" Nachos. I simply spread Beanitos Restaurant Style Chips onto a plate, add my favourite shredded cheese, and salsa sauce. Microwave for 1 minute, top with sour cream and shredded lettuce, and dinner is served. For more protein add cooked chicken or Taco seasoned cooked ground turkey. Take your favourite chicken or vegetable stock, add a cup of cooked rice, a cup of cubed cooked chicken, and a cup of salsa sauce. Heat and serve with Beanitos chips on the side instead of crackers for added Tex Mex flavour. 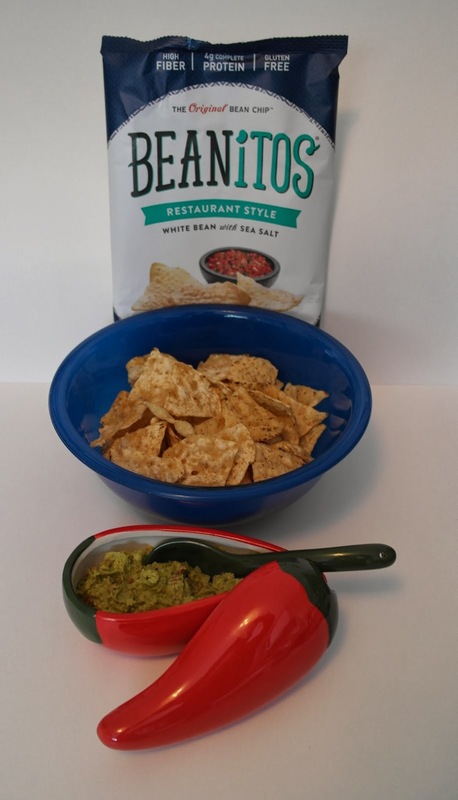 Beanitos has been kind enough to offer my readers a chance to win a Case (6 Bags) of their delicious bean chips. Good Luck! Contest Details: Open to USA and Canada (including Quebec) Age 18+. Contest runs from March 10, 2014 until March 31, 2014. Yep, just me Cathy thinking out loud about Beanitos. Disclosure: I received this product free of cost for the purpose of this review, and have not been compensated in any other way. All opinions are my own. 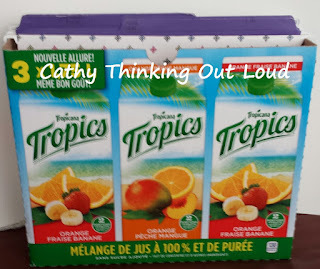 The boxes 3-pack cartons of juice and soy milk come in hold hanging file folders perfectly, and can be instantly recycled into free document and paper organizers. Do you ever buy juice or soy milk in a box of 3 cartons? Turns out the boxes they come in are the perfect size to hold hanging file folders, and to sort and store all sorts of papers. You can clip several together using binder clips to make them into a whole filing system. I put the whole box into a tote bag and bring it on road trips to organize the kids homework by child and subject. I store the textbooks right in the box. I do the same with my blog "stuff" and conference information when attending conferences. I use one to organize school papers for the current year: such as course contracts, teacher contact information, the school board calendar, and current semester schedules. I clip 4 boxes together for each of my kids. 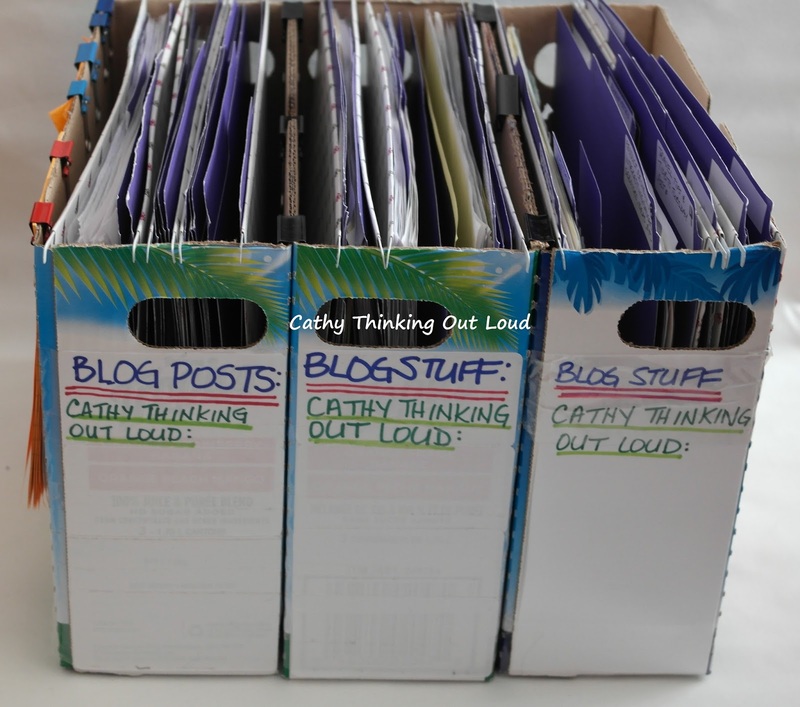 One box for each of their current school subjects, and have them file notes from completed units, quizzes, tests, etc. into the boxes. Their notes are organized and ready when it's time to study for exams. These boxes are perfect for storing warranties, and/or instruction manuals. I have used them to file forms, notes, ideas, templates, sample letters, and contact information during the planning stages of volunteer projects or events that I have organized. It's so easy to put the entire box into a tote bag and bring with me to a meeting, and at the end of the event I give the box to school council for future reference. They are perfect to tidy up and store magazines by title, year, or theme. Use them to store the kids' art work using one for each child. Recycling these into hanging file holders is fast, easy, free and a perfect way to sort, organize and store papers and documents. If you're crafty cover them to coordinate with your room, or in a theme for the kids. Got a green idea? I'd love it if you shared yours in the comment section. For me green ideas click on the BEING GREEN tab on the blog, or check out my Recycling and Green Ideas Pinterest Board. I read interesting informative posts and articles about business, social media, marketing, networking, and the like all the time. I'm a bit of a junkie when it comes to this type of thing. So I thought I would share at least one said post or article every Friday, and maybe send you into your weekend with some food for thought. This week is about Blogging. I stumbled across Blogging Basics 101 , where I found tons of posts and resources perfect for a newbie blogger like myself. Today I'm sharing three of those posts. Let me know what think, and whether you found these interesting or helpful. Be sure to leave a comment on Blogging Basics 101 too! Blogger Issues: Trying to find that oh so elusive balance. Balance: A harmonious or satisfying arrangement or proportion of parts or elements. (6) via The Free Dictionary. I am struggling with finding a balance between my family, life obligations, things I should do, social media interactions, and blogging. They all seem to cross over and the boundaries are blurred. This is certainly how my family sees it. To them it appears that, writing for the blog, twitter parties, entering a contest, and connecting with friends on social media, are all the same thing. So they have the impression that when I am at my computer I am just playing on twitter" again, and neglected them. To be fair to them, sometimes this is true. I have two teen boys that sometimes I truly am happy to avoid, or put some distance between them and myself. Only another blogger will truly understand how much effort is required to write and maintain a blog, or the considerable amount of time required to outline, write, possibly research, take pictures for, proof read and edit each post. It is far more time consuming than I ever imagined until I started blogging. I find as a new blogger the time commitment and the learning curve to be overwhelming, and this often results in total inaction. To deal with the time management, and to un-blur some of the boundaries I decided to approach my blog like a job, which I should have done in the first place. I thought the process of doing this would bring me closer to finding a balance that works for me. With the use of an agenda I hoped to schedule in specific times for all the different activities in my life. I also thought by sharing this said agenda with my family, they could see, and understand where my hours go. Just because I am at the computer doesn't mean I am just "playing on twitter" again. Assuming 24 hours in a day (which I do) and 8 hours of that is for sleep. That leaves 16 hours a day. The above schedule would take up 14 of those hours on weekdays, and 12 on weekends. Of the 112 hours a week available, this schedule would take up 91 of them. WOW! life is busy, no wonder I feel overwhelmed. That doesn't leave much time for one on one time with my family, or breakfast with a friend. But, going through this process has helped to focus my attention, understand I need to further prioritize what is important, and realize time management is going to be the only way to do all or most of the things I would like to do in my life. Clearly it is going to take more than one draft. Baby steps. Andrea has been blogging for quite some time, and her blog has been around since at least 2006, making it something "old"er but still very relevant. Both blog and the blogger are examples of excellence for newbies like myself. This is a blog worth taking the time to visit. peek inside the fishbowl " ...because content is king, er queen"
Kim, the voice of Chatters of Gabby, is "new" to blogging, but she is keen to learn, has a great sense of humour, and is a lovely person inside and out. For those reasons alone, you should check out her blog, say hello, and leave a comment. Chatters of Gabby "Sassy, Opinionated, Honest"
We all get "blue", and struggle at times in our lives. The blog End the Crazy Talk is trying to open up dialogue, and share, in order to support, give insight, and educate about mental illness. This is a must visit blog in my opinion. Sandy is kind, honest, and brave, and only by people like herself blogging, and talking about the subject of mental illness will we see real change. Borrow her lead, and open up dialogues of your own. End the Crazy Talk "erase the stigma...open your mind"
Well there you have it, something Old, something New and something Blue, and the I consider the links I am sharing something Borrowed to post on my blog. 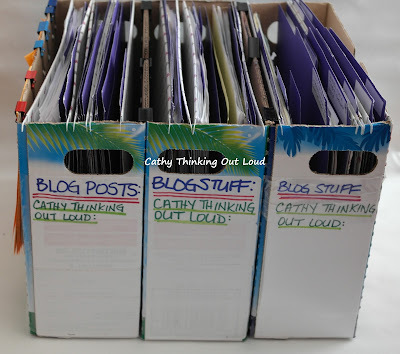 Yep, just me Cathy thinking out loud about interesting Blogs. "After 10 years in foster care, teenager Lux tracks down her real parents to authorize her emancipation. But she lands in their joint custody instead." I thought this was a quirky series, that was funny, entertaining, and often insightful. Life can be messy, and unpredictable, and there is often humour in that. I thoroughly enjoyed this series.